*A game designer at the University of Southern California leading a team to design a video-game version of Thoreau's Walden Pond. *A young neuroscientist and game designer whose research on "Math Without Words" is revolutionizing how the subject is taught, especially to students with limited English abilities. *A Virginia Tech music instructor who is leading a group of high school-aged boys through the creation of an original opera staged totally in the online game Minecraft. Experts argue that games do truly "believe in you." They focus, inspire and reassure people in ways that many teachers can't. 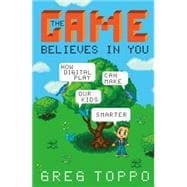 Games give people a chance to learn at their own pace, take risks, cultivate deeper understanding, fail and want to try again-right away-and ultimately, succeed in ways that too often elude them in school. This book is sure to excite and inspire educators and parents, as well as provoke some passionate debate. Greg Toppo is USA Today's national K-12 education and demographics reporter. Toppo was a 2010 Spencer fellow at Columbia University's Graduate School of Journalism and in 2011 he co-led the team that investigated cheating in the nation's public schools, most prominently in Washington, DC, schools under then-Chancellor Michelle Rhee. He lives in Ellicott City, Maryland.